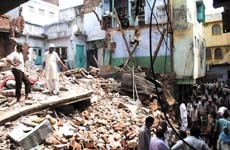 Two women and a child were killed and seven others injured when a three-storeyed building collapsed in Chandni Chowk area of the walled city in the early hours of this morning. Delhi Chief Minister Sheila Dikshit at a meeting today with joint commissioner of police (traffic) Qamar Ahmed expressed her displeasure over the continuing negligent driving by Blueline bus drivers. She held the police as well as the bus operators responsible for the accidents and violation of traffic rules. Fear of ragging loomed large in the corridors of Delhi University and many students were jittery on their first day in varsity, as the new session opened at DU today. However, stringent anti-ragging norms were in place as the authorities went all-out to combat the ragging menace. A Delhi Police booklet suggesting a code of conduct for students and visitors from the northeast has sparked outrage among people from the region, with an MP planning to take up the issue with the union home ministry. With the arrest of Vijay Singh and Ram Parvesh, the police today claimed to have unfolded the mystery involving a murder case that took place a year ago in New Sahabpur Gujran. Three Tihar jail inmates were injured today after a brawl over some petty issue. Ravi, Sanjay and Shamsuddin were rushed to the Deen Dayal Upadhyay Hospital at 10.30 am with injuries, after they attacked each other with sharp blades in jail van. Driven by penury, a West Bengal couple agreed to sell their minor daughter Meena for a mere Rs 9,000. They enacted the drama of Meena's 'nikah' with a buyer and sent her with her 'husband'. The couple then vacated their Vijay Nagar residence and came over to live in Noida. The reports of five missing children of Nithari have been converted into kidnap reports in Sector 20 police here. The action follows special orders from the director general state police. The Noida police have started converting all missing persons' cases registered during last three years as abduction cases on specific orders of UP Chief Minister Mayawati. The mentally-challenged minor girl, who had been found chained in her home in AC Nagar locality here on Saturday, has been admitted to the Escorts-Fortis Hospital here. The proposed foreign educational institutions bill is not likely to be introduced in the monsoon session of Parliament. The information has come a day after the All India Federation of University and College Teachers' Organisations (AIFUCTO) met the officials of the Human Resource Development (HRD) ministry with the same demand. The grave of Razia Sultan, the only Queen to have ruled the city of Delhi from 1236-1240, is lying unnoticed and neglected in the heart of Chandni Chowk even though it has been certified as a historical monument by the Archaeological Survey Of India (ASI). A tantrik, who had been absolved of the murder of a child by Kasna police, was fined Rs 6 lakh by the panchayat of six villages. The fine has to be given to the parents of the boy. 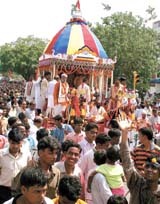 The panchayat handed down the verdict that tantrik was guilty of the murder of an innocent child. The panchayat decision had questioned the functioning of the police department also. The body of senior FCI official P. C. Ram, who died in a crossfire between police and ULFA in Assam last week, was cremated here today, as the family alleged that the incident was a pre-planned operation to eliminate him. Senior BJP leader and MP from South Delhi Prof Vijay Kumar Malhotra today claimed that ever since the BJP came to power in the MCD, development of parks had been given top priority. He also said that tubewells were being repaired so as to provide proper irrigation facilities at the park. The seven injured in the building located in the congested Baradari, Ballimaran area of Chandni Chowk have been admitted to different hospitals where the condition of at least three was described as serious. The dead were identified as Firdaus (60), Famida (55) and Tayyab (13). The bodies have been sent for post mortem examination. According to the police, over ten people were inside when the building collapsed at about 2 am and most of them were asleep at that time. Ten fire tenders and rescue teams were rushed to the spot as soon as the incident was reported. Fire brigade officials said that even after nearly ten hours of operations two teams were still sifting through the rubble for anyone trapped there. The entire area has been cordoned off to facilitate clearing operations. The police said that a case had been registered and further investigations were continuing. According to the police, the building was old and collapsed because of the recent heavy rains. She said her government would be free to take any other stringent action in case there was no let up in accidents. The Chief Minister directed the joint commissioner not to spare any person found violating traffic rules. The efficiency and effectiveness of traffic police personnel deployed must be visible. She underlined the need of installation of red lights on major crossings, announcements regarding discipline on roads, installation of close circuit TV cameras and deployment of addition traffic police officers with motor cycles to ensure safety of pedestrians and curb accidents. The traffic police should also ensure that all Blueline buses were plying in prescribed lanes for which strict vigilance and surveillance would be required. Dikshit instructed the engineer-in-chief, PWD, to demarcate zebra crossing lines on roads and re-demarcate lines where these lines had become dim and were not visible. The MCD has also been asked to take similar action on its roads. Qamar Ahmed apprised the CM about the nature of road accidents and stated that 44 per cent of accidents were caused due to heavy and commercial vehicles. Large number of accidents take place during night hours as untraced vehicles hit down small vehicles and pedestrians. He further said that the Blueline buses have killed 59 persons during current year. The CM requested Ahmed to concentrate on controlling and ensuring smooth flow of traffic apart from issuing of challans on violations. Transport Minister Haroon Yusuf directed the Delhi Transport Corporation's chairman and managing director to give final touches to the revised timetable of buses within a week. He further directed a surveillance of Blueline buses so that these buses refrained from overspeeding and overtaking other Blueline buses. All efforts would be made to recruit drivers on contract to overcome shortage. Freshers were seen palpably nervous at Hansraj College. "Naturally we are very apprehensive and expect some ragging despite arrangements. Many students have stayed away because of this fear and plan to join after a few days when ragging fear is less," said Deepak, a student at the college. Another student Gayatri opines, "This is really a new start for me and I will not forget this day. My first day at college here has been good so far. There has been no sign of ragging. Let's see what happens ahead." Some 35,000 students have been admitted to DU for undergraduate courses. The scene in most colleges was quite lively. Students were seen freely mingling with one another. Most colleges have set up anti-ragging squads that are monitoring the behaviour of students on campus. While a section of the people from the northeast termed the booklet titled Security Tips for Northeast Students/Visitors in Delhi, issued by the west district police, as helpful, many have taken exception to what they described as its insensitive advice. The booklet advises girls from the region to avoid wearing any revealing dress and has suggestions about cooking smelly food without creating a ruckus in the neighbourhood. Arunachal Pradesh. If it is true, I will meet home minister Shivraj Patil and lodge a strong protest, he said. A committee of students from the northeast has convened a meeting on Saturday to discuss the issue, said Lalzarliana, president of the Mizo Students Association. "We strongly object to the remarks on food and dress. These comments are not in the proper spirit," said Savanai, vice-president of the Naga Students Union. A half-dug skeleton was recovered by the police from a house in New Sahabpur, after receiving a complaint from one of the neighbours. A case of murder was registered but it was very difficult to identify the dead body. According to the police, the residents of the area believed that the house was haunted and there were ghosts in the house. After contacting the owner of the house, the police found a link to Satender, who informed that his brother had been missing since last one year. The deceased had gone to meet the previous owner of the same house. Satender's family identified the body as Dharmender, his brother. The previous owner of the house was Vijay Singh, who sold the house to Rakesh Sharma. The police claims to have apprehended Vijay from Samastipur, Bihar. According to the police, Vijay allegedly revealed that Dharmender used to visit his house and had developed illicit relations with his wife. In August 2006, Dharmender came to his house and enquired about his wife, who had left the house in the evening. Vijay Singh served him liquor so much so that he became unconscious. Then Vijay, along with his friends, allegedly strangulated him with a cloth and buried the body in a pit on the floor and applied cement on it. According to the police, the incident occurred in Raja Garden area when a jail van was taking ten inmates to the newly-constructed Rohini jail in North West Delhi. Driven by penury, a West Bengal couple agreed to sell their minor daughter Meena for a mere Rs 9,000. They enacted the drama of Meena's 'nikah' with a buyer and sent her with her 'husband'. The couple then vacated their Vijay Nagar residence and came over to live in Noida. But when the young girl realised what had happened, she escaped from the clutches of her buyer. A stranger woman is learnt to have come to Meena's help. The victim is now living with this woman in her house. According to information, Intu of Madnipore district of West Bengal was living in a rented house in Vijay Nagar with his two daughters Meena, 17, Chand, 16, and a 19-year-old son Imtiaz. While handing over Meena to Chandu, Intu told his daughter that he was her husband. Before sending her off finally, Intu had also held her 'nikah' with Chandu. Chandu kept Meena as her wife in his rented house in Vijay Nagar for a few days, later he took her to his village Nekpur in Muradnagar. When Meena happened to overhear Chandu and his uncle who was demanding his money taken by Chandu for the purchase of the girl, she realised her position. She escaped at an appropriate time and reached Vijay Nagar. When a woman Shanti heard Meena's story, she was so moved that she brought her to her own house. Shanti took Meena to Vijay Nagar police station where they were told to come some other day as a farewell party was on for an SO. Meena has refused to go back to her parents, Shanti says. The parents had stated that their children had been abducted from around Nithari's Khooni Kothi, D-5, Sector-31, here. A year ago the reports of 17 kidnappings, including 14 children, had been registered. Paresh Pandey, SP ,city, said Laxmi, wife of Ram Swaroop ,a resident of Nithari ,had filed a report in Sector-20 police station that her 10-year-old son Suraj was missing since last year She fears that her son was abducted near the water tank in Sector-31. Now, the police has converted the report on Suraj's missing into a kidnapping report, the SP said. Similarly, Sonu, daughter of late C .H Jolly, another resident of Nithari, has filed a report that her 10- year- old sister was abducted from Nithari on May15 ,2005. Nasreen, wife of Yakub ,has also filed a complaint that her 11-year-old son Rahil was kidnapped from Nithari village on April 24,2006. Besides Suresh Babu from house No. 420 ,Sector-29 has also lodged a report with the Sector-20 police that his 10-year-old son Umesh was abducted from Nithari village. None of these persons have since heard about their children. Murti Devi ,wife of Prem Saini of Chhalera village has also lodged a report that her 14-year-old daughter Neelam was kidnapped from Nithari village in February ,2005 near the water tank. After converting the cases of five missing Nithari children into kidnapping cases, the cops in other police stations have also started registering or converting all missing persons' cases under section applicable to kidnapping cases. In recent days, Mayawati had issued orders that all cases of missing persons filed during the last three years in the state be registered afresh as cases of kidnapped persons. All the complaints suspect Surinder Koli and his master Moninder Singh Pandher of D-5, Sector-31, here,behind the kidnaps. A team of the health department and the District Red Cross Society that did not find the girl in her home yesterday has found her in Noida, where she and her mother had been taken by a team of a news channel. The officials of the health department and the Red Cross Society have announced to provide free treatment to the girl. The Chief Medical Officer (CMO) of Faridabad Dr Pankaj Vats told 'The Tribune' that initial check-up of the girl, Priya, was conducted on Saturday night and she was also kept under observation. He said it had been found that the girl was sub-normal in her behaviour and had fever at the time of check-up. He said the MRI and other tests had detected that she had been suffering from post-encephalitis sequelly disorder that could have been developed due to improper diagnosis and treatment of brain fever, which she had suffered when she was one-and-a-half year old. Dr Vats said that the HB level in Priya was low and had slight fever. He added that the girl would be kept in hospital for two or three days before taking further decision regarding her treatment and rehabilitation depending upon the consent of her kin. Claiming that the doctors did not find any permanent marks or external injury on her limbs which proved that she had not been chained constantly by her family, Vats said it was possible that she might have been tied with a cloth or soft rope occasionally to stop her from wandering out. Priya and her mother have been staying at her maternal grandparent's house since her father left them. Her mother runs a shop and a dairy to earn a livelihood. A detailed report in this connection has been submitted to the Director-General, Health, Haryana. Dr Vats claimed that at least two to three cases of such disorder were usually reported to the main hospital here. A four-member delegation of AIFUCTO led by general secretary V.K Tewari held an hour-long meeting with HRD officials recently to discuss their demands, including withdrawal of the foreign university bill. "A top official of the HRD ministry disclosed that the foreign university bill will not be introduced in the coming monsoon session of Parliament," said Tewari. The teachers' body also urged the ministry not to accept conditionalities envisaged under General Agreement on Trade in Services (GATS) and demanded that any condition accepted so far should be rescinded by the HRD ministry and the University Grants Commission (UGC). Left parties, too, have been opposing the bill. CPI (M) leader Brinda Karat, among others, reportedly met HRD minister Arjun Singh on July 12 to record the left's opposition to the proposed bill, on the grounds of the principles of equity, access, relevance and excellence. "The HRD officials also disclosed that a bill in respect of private universities that was never legislated into an act had also been repealed," said Tewari. "The federation also held detailed discussion on liberal grant of deemed university status to educational institutions in the country." Expressing concern over it, he revealed that the number of institutions enjoying deemed university status, which was just 30 in 2002-03, has jumped to 112 now. AIFUCTO demanded a curb on degree-granting status to institutions, claiming it has led to lowering of standards in education. Meanwhile, the ministry informed the organisation that the case relating to their demand for constitution of UGC pay revision committee has been processed by the HRD ministry and is ready for reference to the union finance ministry. The grave is very difficult to locate as it lies in the maze of narrow lanes and bylanes behind Sita Ram Bazaar in an area known as Pahadi Bhojla and there are no signboards. According to the residents, the condition of the monument is indeed pitiable. There are two graves on the platform--one of the Queen and the other of her sister, Shazia. On the western side of the monument, there is a makeshift mosque. There is no roof above the graves and thus they are constantly exposed to the elements. The platform itself has started crumbling because of the neglect and the residents fear that if urgent steps are not taken, the historical monument could well disappear in a couple of years. A local shopkeeper Mohammed Rizwan said, "The government is not taking necessary steps to protect the monument. Just one or two persons visit this grave every day. Very few people know about the existence of this monument," he added. The monument is not getting appropriate attention. It holds immense historical importance and should be handled carefully, says Yousuf Gilani, another shopkeeper of the locality. The officials of ASI also conceded that the monument was in a bad condition but at the same time claimed that necessary renovation was being conducted every year. The officials revealed that the monument had been encroached upon for quite some time and was only cleared two years ago and hence the neglect. Senior ASI officials claimed that they now plan to write to the Municipal Corporation of Delhi (MCD) to provide direction boards for the monument so that it could attract tourists interested in the history of the walled city and the national Capital Territory of Delhi. According to information, Mohit, an eight-year-old boy had been stabbed to death on July 9 in Sirsa village under Kasna police station. Mohit's father Ranveer Singh lodged an FIR against four boys Bittu, 12, Joginder, 14, Rinku, 10, and Tinku, 8. A tantrik was also suspected for his role in the crime. Mohit's sister Renu had given a statement to villagers and the police that she had seen tantrik, Ballu, coming from the field from where her brother's body had been recovered. The tantrik had later fled from the village along with his family. The police claiming to have cracked the murder case had sent 13-year-old Brijmohan to jail on July 11 charging him with murder. This police version was not found acceptable to villagers. Under pressure of villagers, police took the tantrik into custody but released him after two days of interrogation. Meanwhile, people of six villages had called a panchayat in Sirsa village which on Wednesday had given its verdict holding the tantrik guilty of Mohit's murder and pronounced a penalty of Rs 6 lakh on him as compensation to Mohit's family. The Kasna police SO Sunil Pichauri, however, said that he would not allow anybody to take law into his own hands. The cremation took place at the Lodhi crematorium after a second autopsy of the body was conducted at LNJP hospital. The family wanted to prove that Ram was deliberately killed on July 11 at Borkapanitenga village in Assam. Ram's son, Prabin claimed that Ram was hit by four bullets and all were fired by the Assam police. "If you see the ground situation there, it will be evident that it was not an encounter but a pre-planned killing. And this was done by the Assam police," alleged Prabin. "How will you shoot a person in the head if you are supposed to be rescuing him." The family has already demanded a CBI probe into the incident. "Probably my father knew certain things which the police wanted to keep under wraps," alleged Prabin. Ram, the FCI executive director who headed the organisation's operations in the Northeast, was kidnapped in April from Guwahati. Senior BJP leader and MP from South Delhi Prof Vijay Kumar Malhotra today claimed that ever since the BJP came to power in the MCD, development of parks had been given top priority. He also said that tubewells were being repaired so as to provide proper irrigation facilities at the park. Owing to construction of Metro rail, trees were cut down at many places. "So to overcome the loss, the MCD is planting additional saplings of trees," he said. Inaugurating the plantation drive launched by the MCD, Prof Malhotra said that BJP had always worked for development of the city. A majority of the parks were developed in the national Capital during the reign of the BJP or its sister organisation, he claimed. Mayor Arti Mehra, Leader of the House Subhash Arya and chairman of the Standing Committee Vijender Gupta were also present on the occasion. Giving details, the Mayor said that parks were being provided the facility of irrigation through tubewells. As many as 85 plants of various species as well as 2,600 attractive bushes have been planted in the parks.